Observed in Kerio Valley, Kenya. Dec. 2014. I think this spider is an adult male as evidenced by the enlarged pedipalps at the anterior, and attached near the mouthparts on the cephalothorax ahead of the first pair of legs. Males generally give up feeding and devote their risks and energies to roaming about in search of females. Selenopid (a.k.a. Flattie) spiders catch prey without using a snare web. 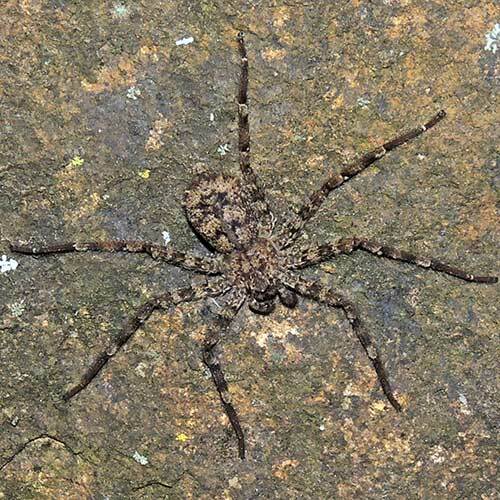 Instead they move about at night on rock surfaces or within cracks locating themselves at prime spots to encounter crawling prey. The forward two pairs of legs are slightly rotated anteriorly giving the spider a crab-like stance. There are six eyes in the first, anterior, row. Copyright Michael J. Plagens. Page created 12 November 2014.